South Korea plans another flight of its small satellitelauncher in June, nearly a year after the rocket's first mission was doomedwhen its payload shroud did not separate, according to the rocket's Russiancontractor. 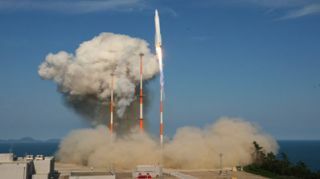 The first stage of the Korea Space Launch Vehicleis about to be shipped from Russia to South Korea, the program's Russianindustrial partner said in a statement Wednesday. The 93-foot-long first stage was transported by train fromKhrunichev to an airfield Wednesday. The vehicle will next be loaded into acargo plane to fly to Busan, South Korea. From Busan, the rocket will be loaded onto a ship to sail tothe Naro Space Center on a small island off the southern tip of the Koreanpeninsula, Khrunichev said in a statement. The company also oversaw construction of the SouthKorean launch site, which includes a launch pad, processing facilities anda control center. Khrunichev's written statement said liftoff of the secondKSLV, or Naro, rocket is scheduled for some time in June. The KSLV first stage is powered by a single kerosene-fueledRD-151 engine, a downscaled version of the engines used to propel Zenit andAtlas rockets from Earth. The RD-151 engine produces about 375,000 pounds of thrustduring the first four minutes of flight. The stage is based on the UniversalRocket Module being developed for the Russian Angara launcher designed to haula wide range of small to large satellites into space. For KSLV missions, Khrunichev swapped the Angara's morepowerful engine for the smaller RD-151 unit. According to Khrunichev, the Russian-made first stageperformed well during the KSLV'sinaugural flight last August, but the mission failed to reach orbit becausehalf of the rocket's nose cone failed to jettison. The payload fairing was supposed to split open and separatelike a clamshell a few minutes after liftoff. The 108-foot-tall rocket wascarrying a small Earth observation and demonstration satellite for the KoreanAerospace Research Institute, South Korea's official space agency. Officials said the Korean-made solid-fueled second stagealso worked as expected during last year's test flight.